It’s not every day that you meet a Financial Advisor who is also a dedicated volunteer firefighter. But this is exactly how John "Cort" Cortapasso, CFP®, CRPC®, First Vice President / Investments, with Janney’s Garden City, NY location, has chosen to devote the past 25 years of his life. He never felt passionate about becoming a firefighter. It was not a dream of his to risk his life to save others. He just felt that it was the right thing to do. When John, his wife of 35 years, JoEllen, and his three children who are now adults, Jessica, John Jr., and Jason, moved to a small town in Long Island, NY in the late 1980s, he felt the need to give back to this local community in a meaningful way. After completing a two-year term as Chief and serving as Chairman of the First Battalion Chiefs Association, one of nine battalions in Nassau County, NY, John is still an active firefighter. He has fought many fires over the years and continues to be available 24/7 to step up and risk his life to save the lives of others. John’s courageousness extended to his decision to join his fellow firefighters and other first responders at the World Trade Center after 9/11. “My clients have really embraced me being a firefighter. I think they feel like if I’m willing to give back in that way, I’m worth them putting their trust in me. It has made them respect me more and regard me in a positive way,” said John. 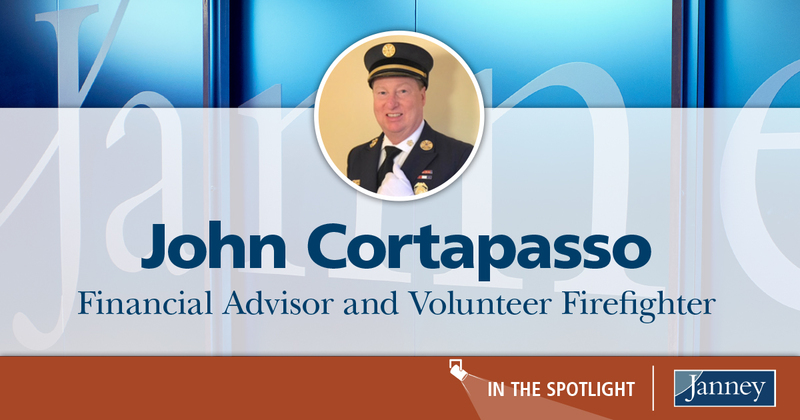 John’s work and leadership as Chief of the Bellerose Fire Department has also benefited his work as an Advisor. “My time as Chief gave me good experience in building leadership skills and decision-making capabilities. Leading a Fire Department has transcended into my business. It has also given me a well-rounded life. In addition to the special bond I have with my fellow firefighters, I feel like I’ve achieved a meaningful life at home, at work, and for my community,” said John. In addition to his work and significant community investment, John’s resume also includes more than a decade of coaching his boys in multiple sports. These days John focuses his spare time working on his golf game and he and his wife are enjoying their first grandchild.